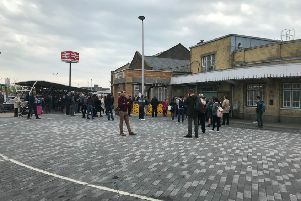 People living with disabilities have made recommendations to improve disabled access provision at Eastbourne Railway Station. Following the success of their trip with Southern Railway in April last year, a group from Possability People attended their third ‘Try a Train’ event from Brighton to Hampden Park via Eastbourne, hosted by Govia Thameslink Railway (GTR). Possability People is a Brighton-based charity supporting disabled people and people who have long-term health conditions or impairments to live more independently. Charity members were able to carry out an access review of Eastbourne station suggest solutions to help improve customer experience by using their own experience of disability. The group assessed everything from toilet facilities and café access to parking, signage and seating. Lilly Kennard, engagement and inclusion manager for Possability People said: “The Try a Train days provide an important direct link between disabled people and GTR/Southern Railway for disabled people to have their voices heard on the issues they face when accessing train services, and what would help overcome these barriers to improve overall experience and accessibility for all. “Through utilising disabled peoples’ experiences to provide solutions on how to make train travel better and easier to access for everyone, we are able to raise awareness directly with the train company on people’s problems, and how making small changes can make a big difference to enabling people to use trains more confidently and independently. The day was led by GTR’s train presentation manager, Anthony Dowsett , who was supported by colleague Ros Glossop.